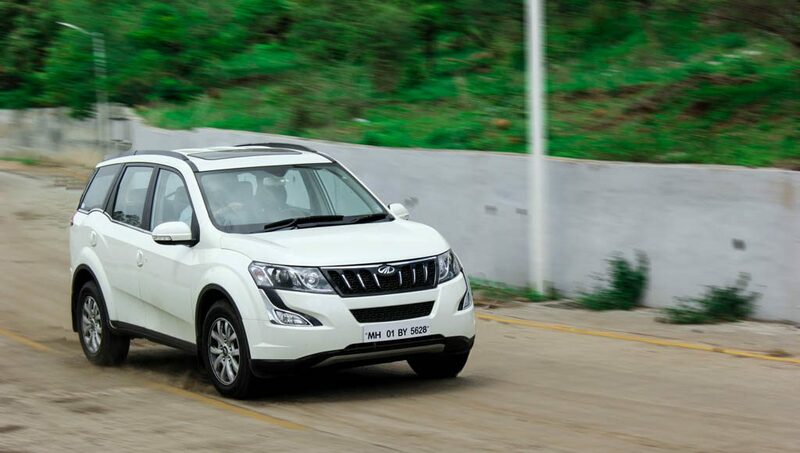 Mahindra is known to be the king of the SUV segment in India. 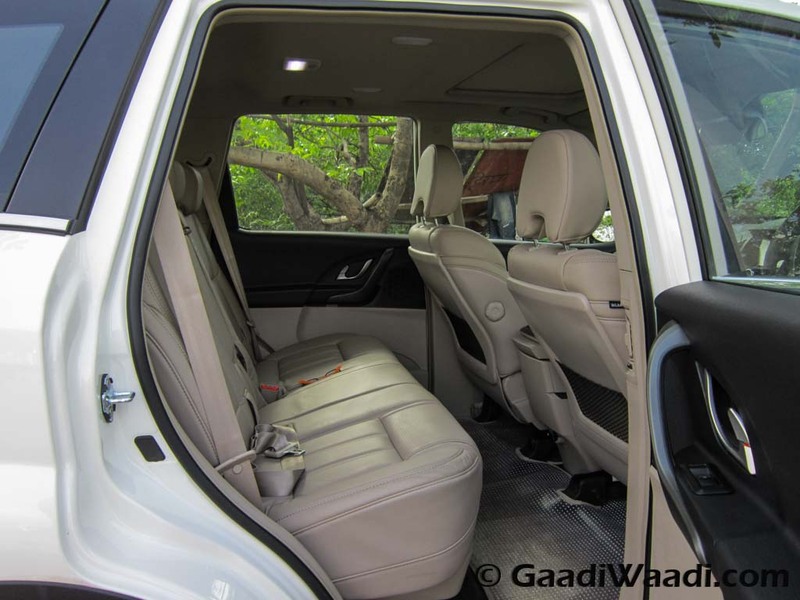 The Mahindra Scorpio had rocked the sales charts continuously, it was considered not the best product in its category mechanically. 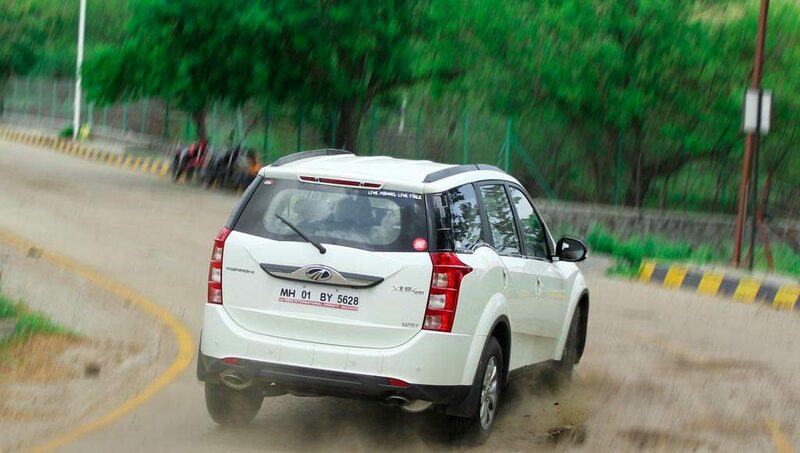 Then came the XUV 500, which changed everything for Mahindra. The highlight being the monocoque chassis which gave it car like to drive, go easy on the pocket as well. Features list and value for money quotient allowed Mahindra to tell its customers to hold their horses as they couldn’t make as many cars which the customer demanded. 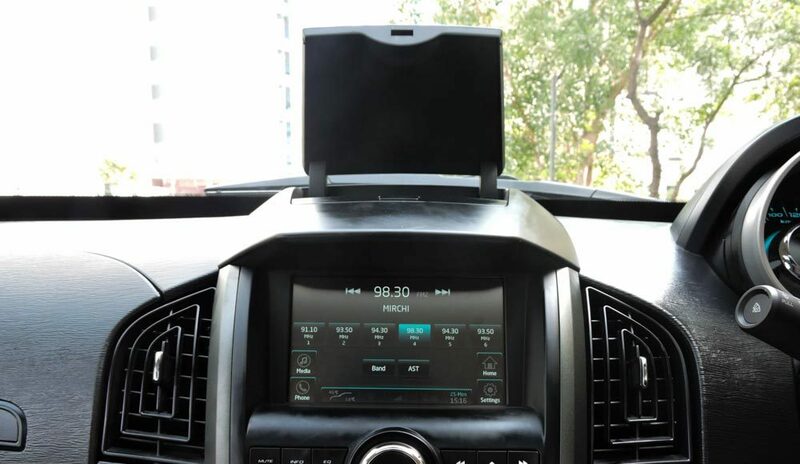 Scorpio was updated recently and it was the turn of the XUV 500. 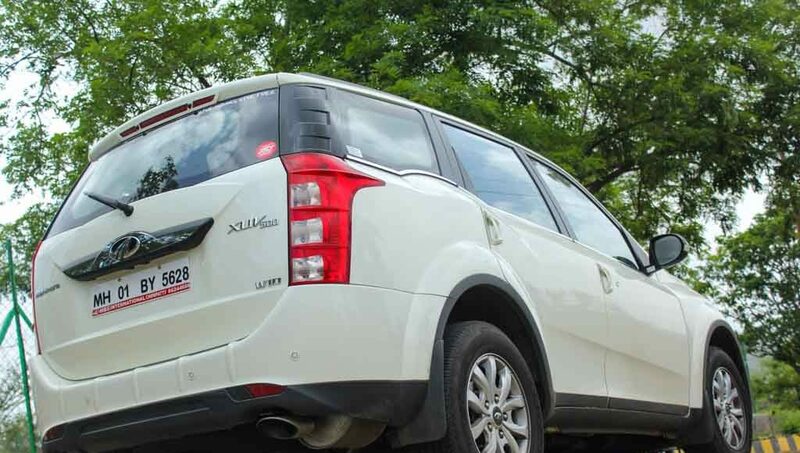 Mahindra calls the XUV 500, the New Age XUV. What has changed? What is new? Has it got stronger or weaker?. 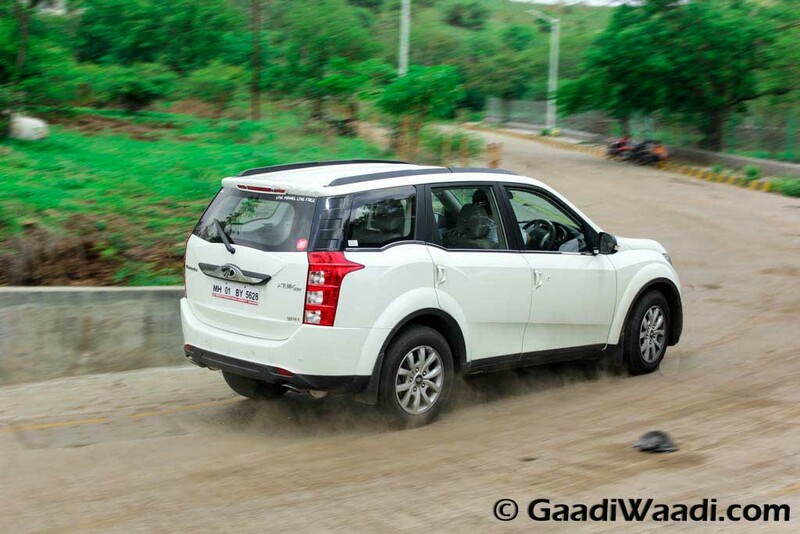 We put the XUV 500 to a rigorous test to find out if Mahindra can once again be the segment leader, by many miles ahead of its competition. So why wait? Let’s find out! 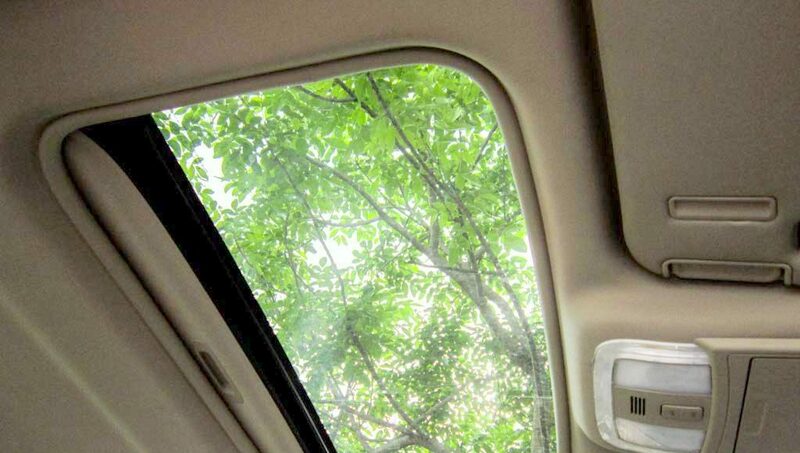 The design of the XUV 500 has been applauded and criticized at the same time. 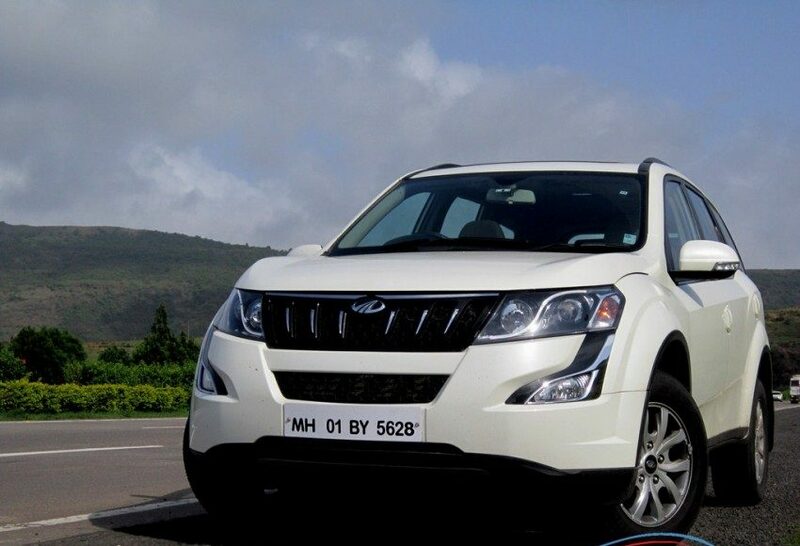 While, the design was completely new from Mahindra and the overall package was good. The front which was very garish, busy and overdone at the same time. Side profile was good enough, but the hunchback at the rear window wasn’t to people’s taste either. Rear was tastefully done, but then the taillights had cheetah embossing, which was yet again good attention to detail but not loved by all. 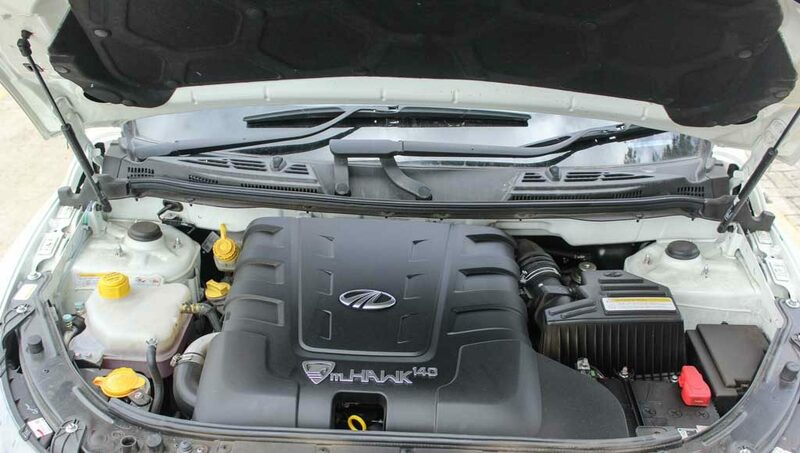 The good thing is, Mahindra takes feedback seriously and has improved quite a bite in these areas. 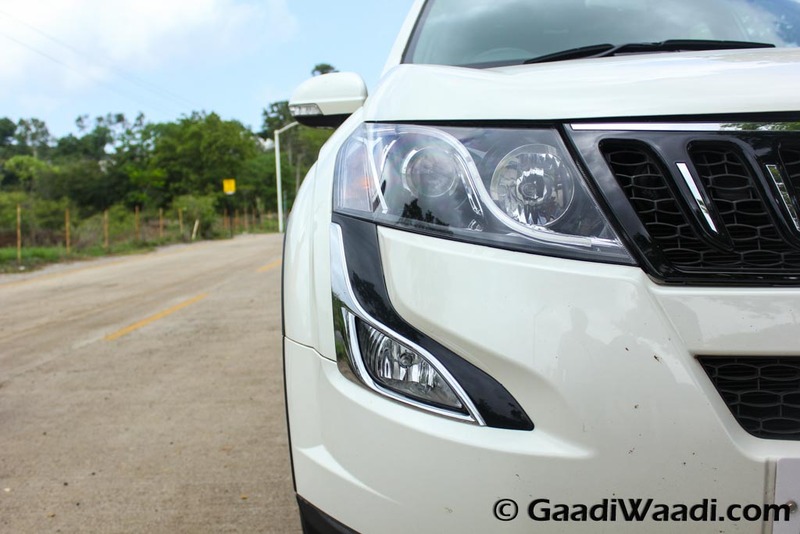 The front design is almost all new with new headlights, new age grill has seen on the Scorpio first which resembles the slats on the grill that is a synonym with Mahindra SUV’s. Headlights are still huge and they now look like they merge with the fog-lights below. Lower part of the grill is smaller than before. The design of the bumper and flared arches remain pretty much unchanged. Coming to side everything is identical except for the chrome strip on the window line to make it more upmarket. Rear remains unchanged except for a chrome strip over the number plate. 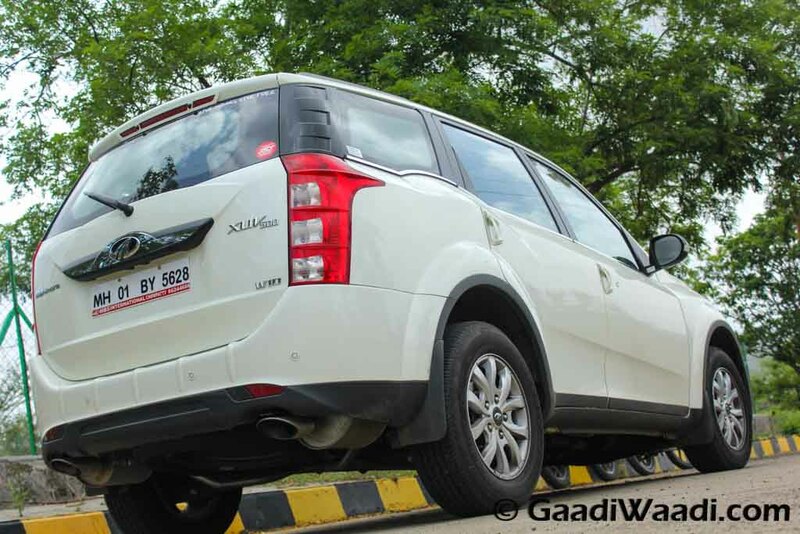 Overall, changes the XUV500 has got is what it actually needed. 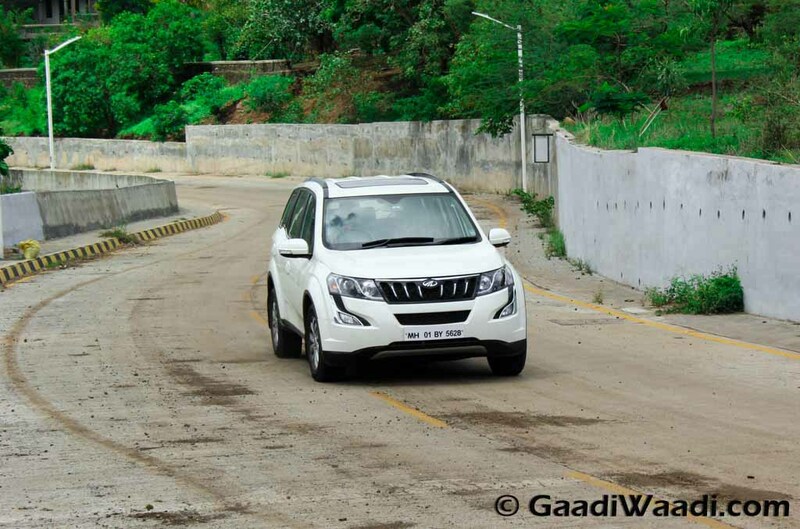 XUV 500 still remains a striking vehicle on the road with a lot of road presence despite slightly less height over its rival. Something that helps in ingress and egress. 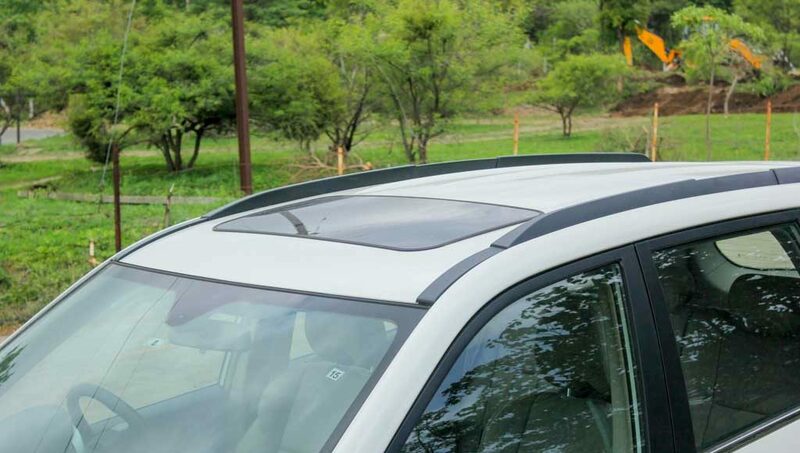 The fit – finish is better on the outside and there are no panel gaps to be found. The cockpit greets you with black and beige interior instead of the maroon color interior with red mood lighting in the predecessor. This time around you have blue mood lighting to lift the ambiance for a more sober taste. 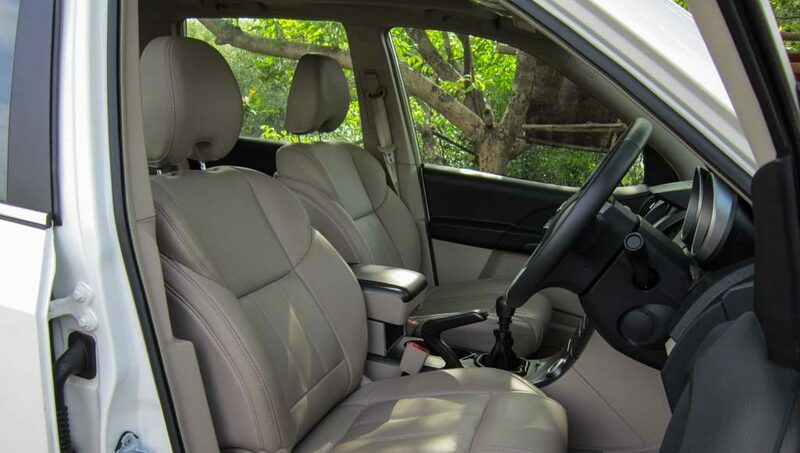 Leather seats are extremely supportive, driver side seats are electric and passenger is a mechanical unit. Centre console is huge and flowing downwards which starts from the touchscreen all the way till the below where you can find buttons for mood lighting and ESP along with the parking light button switch. 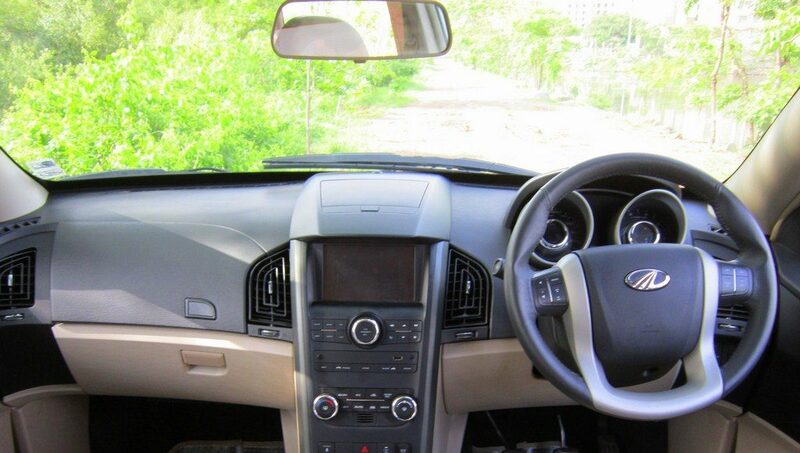 You will witness lot of buttons on the centre console, giving it a feel of premium SUV’s in the market currently. 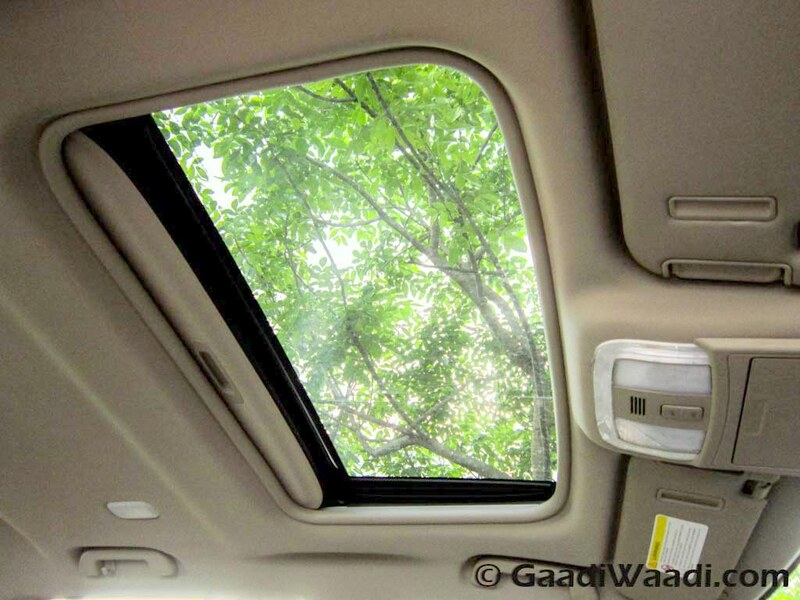 Electric sunroof lifts the ambiance in day and night and gives an airy feel to the cabin in conjunction with large glass area provided by huge windows. Stalks don’t provide exactly the tactile feel you want from the car and Mahindra can work on it to make it better. Stowage area is in abundance. 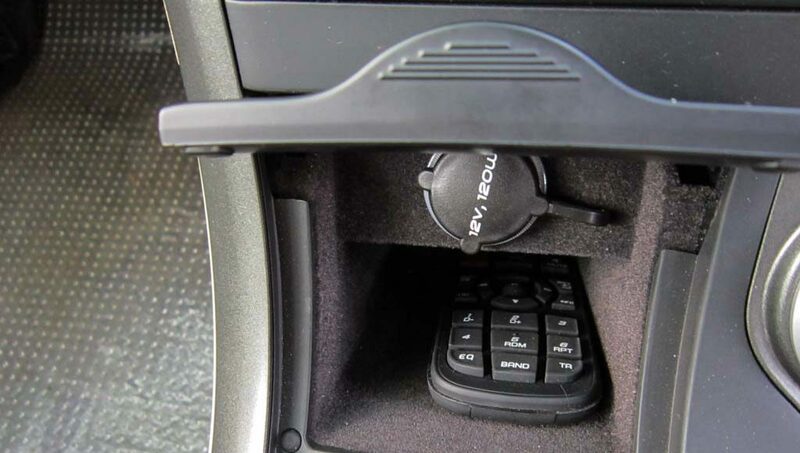 Two gloveboxes, a place to store the audio control remote, the lid bin on the top of the dashboard can store a lot and a huge cubby hole below the centre armrest. Door pockets are useless and cannot store anything which it is supposed to store, a water bottle of any size. There are nets on each side of the centre console at the bottom to store even more things. Phew! You can store things here and there and play hide and seek! 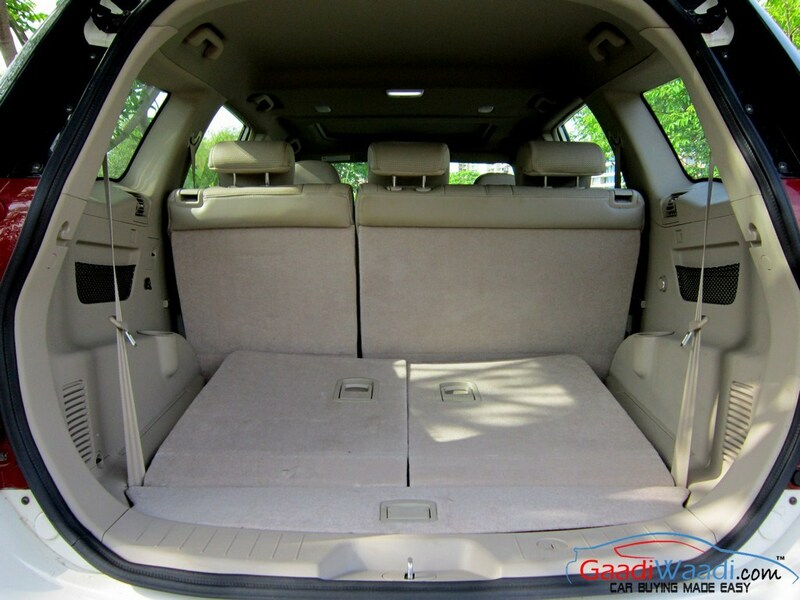 Space in the rear is generous with the dedicated A/C unit which can be controlled from the front. 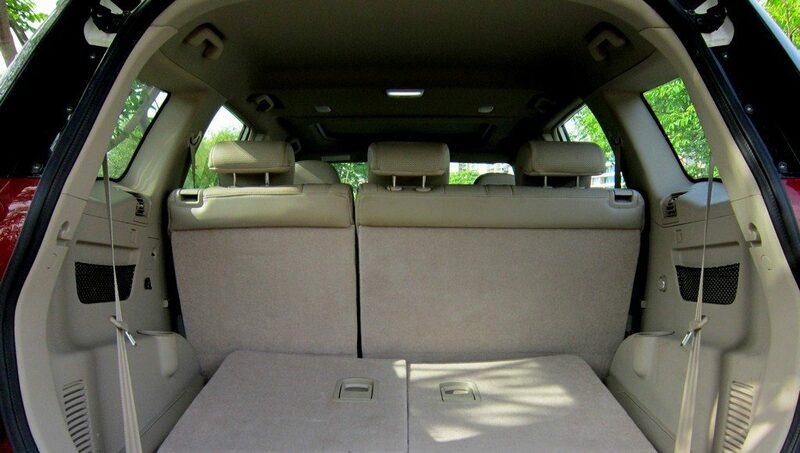 Head, leg, knee, foot and shoulder room is at large and the third person can also make it inside. If not present, middle seat can be used as an armrest that has cup holders in it. There are third row of seats, which is best left to the kids. 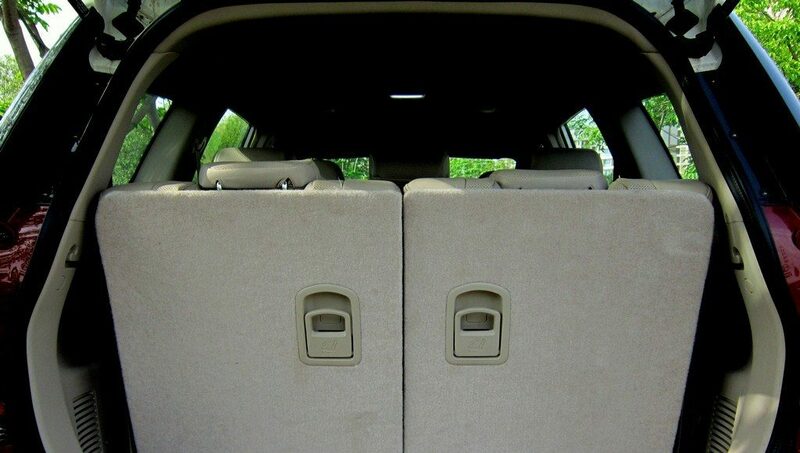 With the third row of seats up, there is a finicky amount of boot space to store anything of what you have. Lights in the cabin are white LED units which will brighten the cabin to day in the night. Acoustics also help lift the ambiance as well if you are a music lover. The sound quality of speakers is good, but not great. 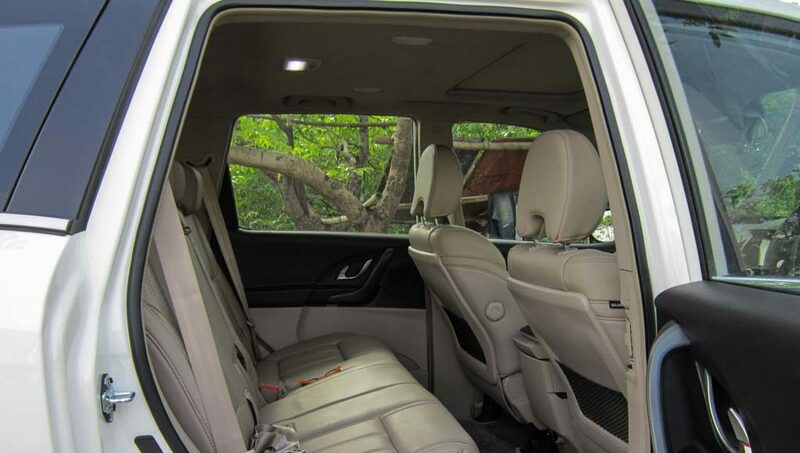 There are options such as the equalizer, which should a bit make things better, but for example, the one on the Tata Safari Storme is a notch above. 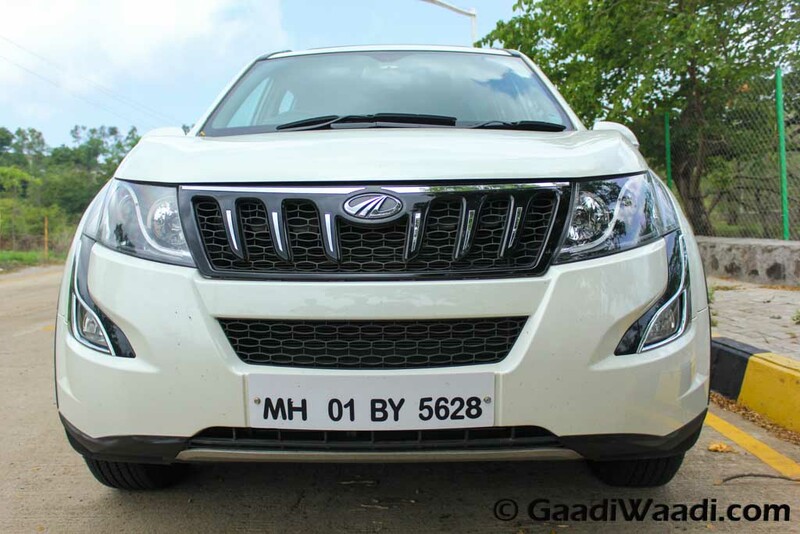 Previously W8 was the most goodies loaded model, but now Mahindra has introduced a W10 which has even more gadgets than before and its the W10 variant which gets AWD. 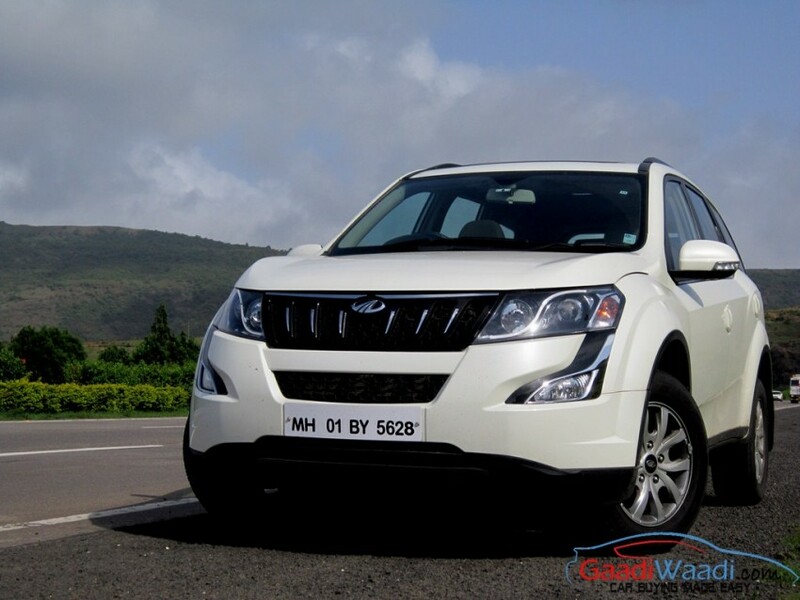 Features list is what makes the Mahindra XUV 500 such an impressive proposition. 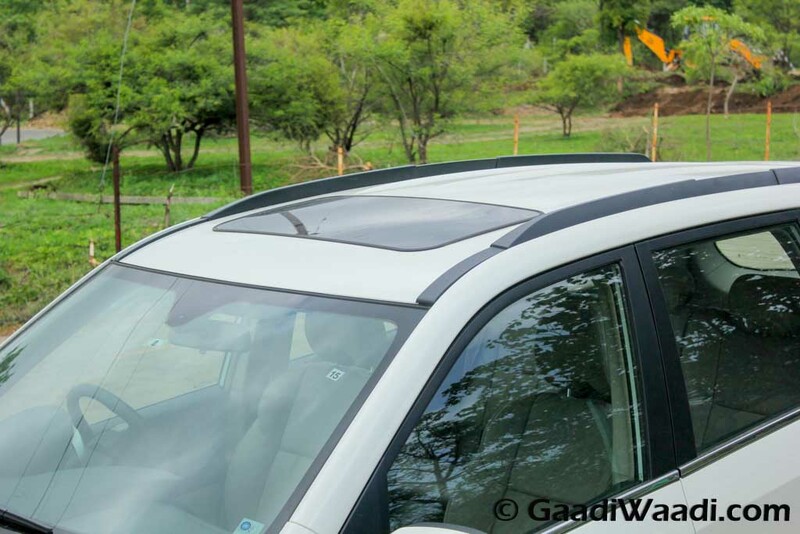 The list includes, electric sunroof, logo projection lamps on ORVMS, 6-way power-adjustable driver’s seat, push button start/stop passive keyless entry that is combined with Mahindra’s micro-hybrid technology. 7-inch touchscreen infotainment with GPS navigation with audio has over 10 plus languages and different type female voices to choose from! 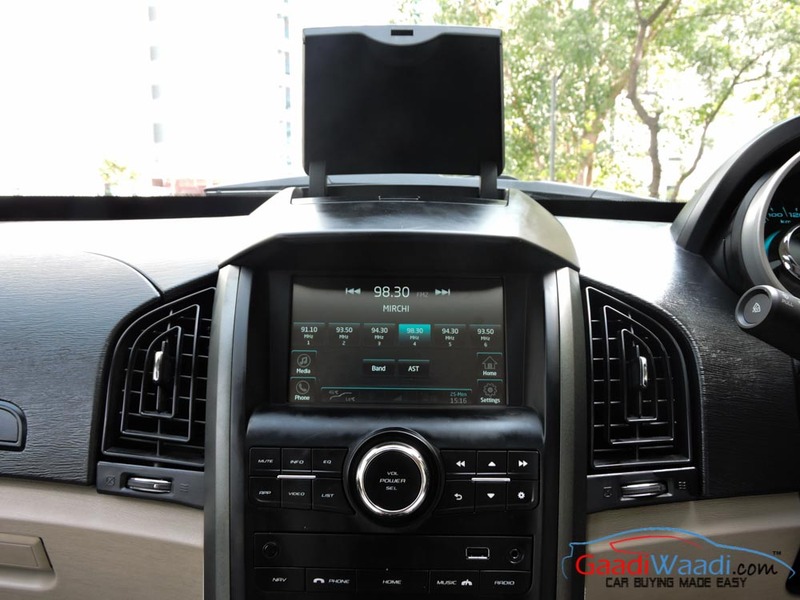 USB, Bluetooth, iPod connectivity and AUX input are standard. Headlights along with DRL and projector makes the night look day as the lamps are extremely powerful on both high and low beams. 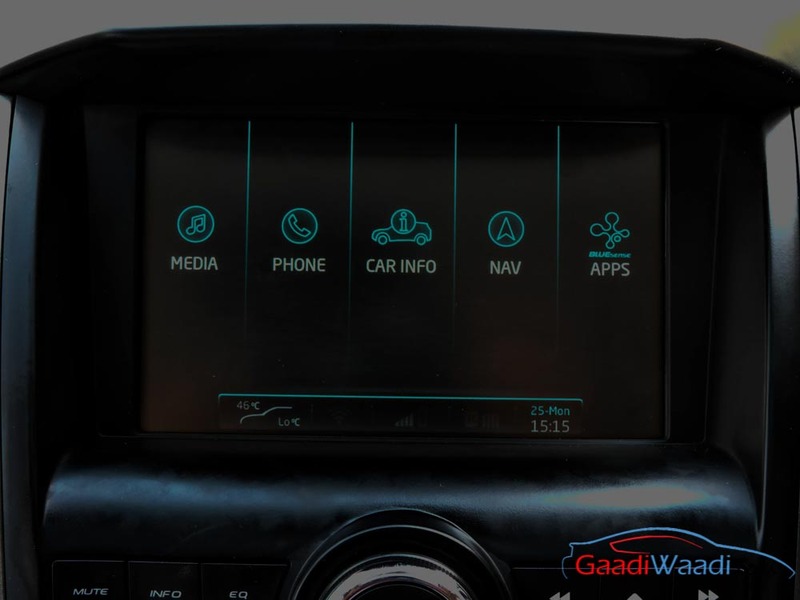 There is also, reverse parking camera with dynamic assist, voice messaging system, voice commands with voice recognition and SMS read outs. 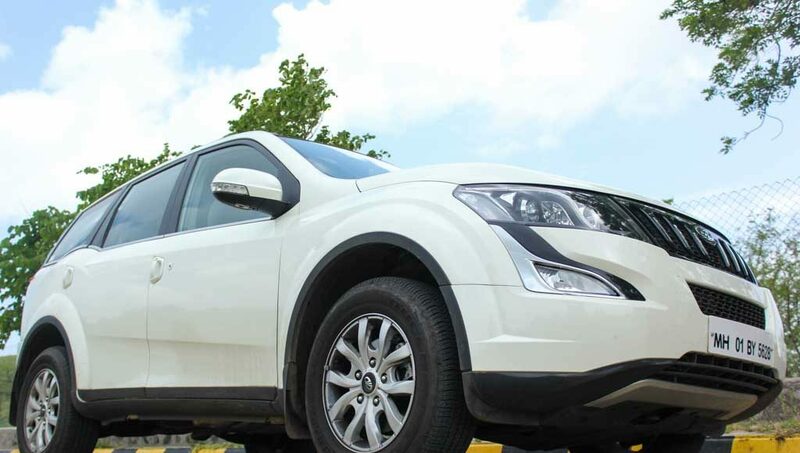 Mahindra has given blue sense® technology to control the music, using your mobile, dual HVAC, fully automatic temperature control, Tyre-Tronics (tyre pressure & a temperature monitoring system). In the twin pod cluster you can find only two trip meters, gear position indicator, which are controlled by buttons on the sides of both pods. 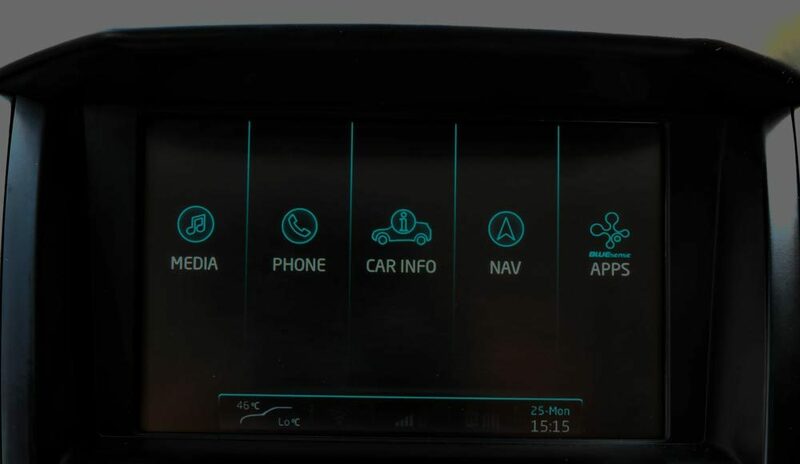 Driver information system, automatic wipers and light sensors along with cruise control and cornering fog lamps are also present. 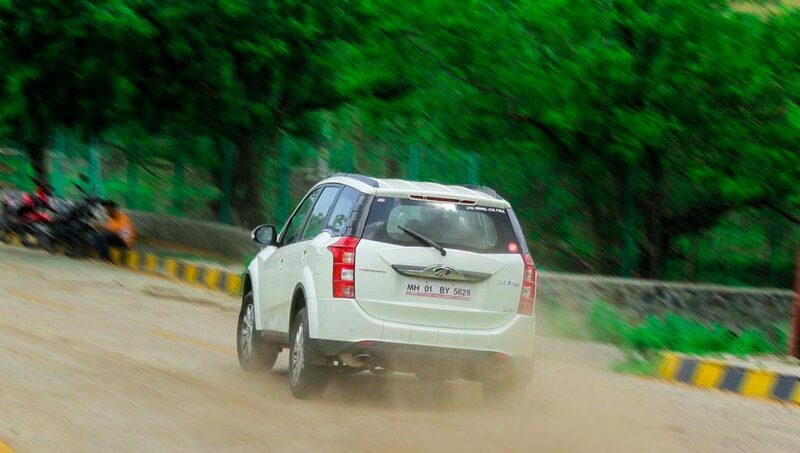 The XUV 500 is powered by 2.2L diesel engine which continues to produce 140 BHP and 330 NM torque from its turbo-charged motor. The motor has re-tuned a bit and now can deliver upto a claimed figure of 16 km/l, but we only manage to get 11.5 km/l in our highway stint and 10 km/l in the city with a moderately heavy foot. The engine is smooth and refined all the way till redline. Even the sound it makes is ALMOST Euro engine alike. 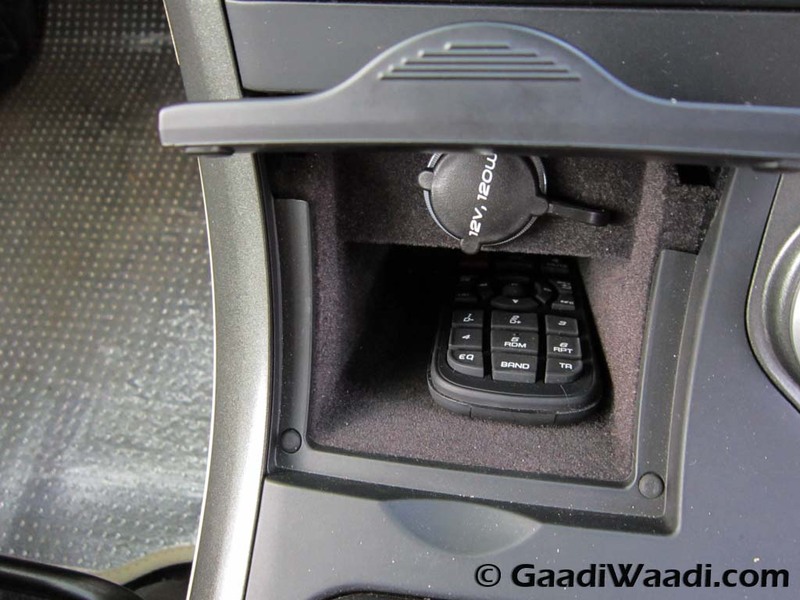 NVH levels inside the cabin are extremely superior than before. 6’th gear and 100 km/hr and it does not even murmur one bit until unless you don’t have A/C or music on. Wind and road noise is also well contained inside the cabin. The engine is an extremely flexible unit as torque delivery, gearing is spot on. The engine is one of the best rated engines because it gives good city driveability and healthy performance on the highway. Cruising at illegal triple digit can you get a speeding ticket if you are not looking at the speedometer. Mash the throttle and you are doing 180 km/hr already given the empty roads. 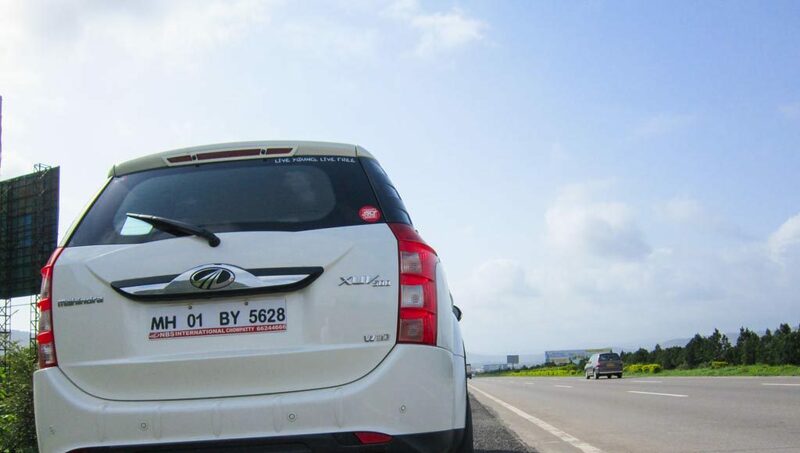 At those speeds XUV is very stable but not as good as the competition that give the rock solid feeling even at flat out speeds. The gearbox has been slightly tuned for better throws. Thanks to short throws, even while accelerating hard off the line or changing gear in mid-range it is smooth, but there is a wee bit of effort required. Acceleration reminds of the kind of massive torque steer this vehicle has. The tyres squeal like an animal in pain and since the steering is lifeless, it isn’t troublesome, but not the best thing to have when the car is all over the place. 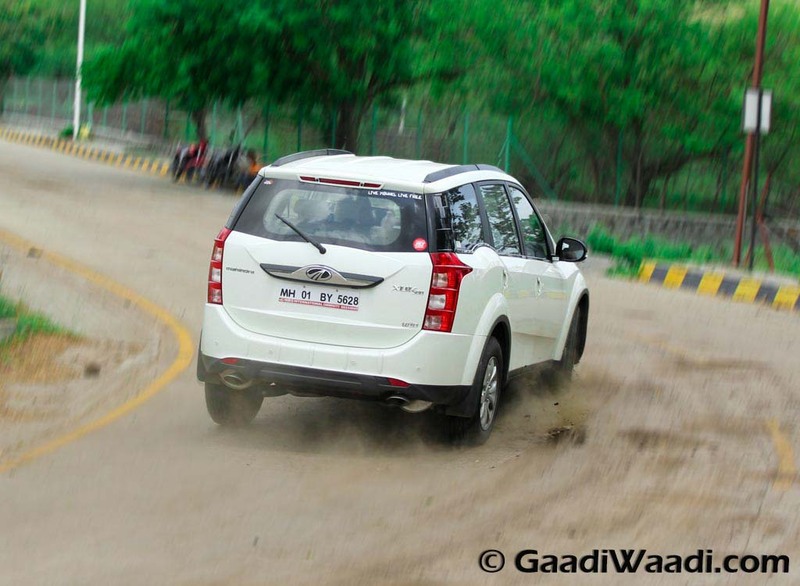 Downsides of so much torque going through the front wheels which steers and puts the power at the same time is also understeer which is present in the XUV. Travel and weight of the clutch are mildly heavy, but can get irritating in hours of traffic jam, but not for a short period of time. The Brakes are excellent courtesy of all four disc brakes around and couple with new regenerative braking it is making best use of kinetic which is being converted into the electric energy for the battery. 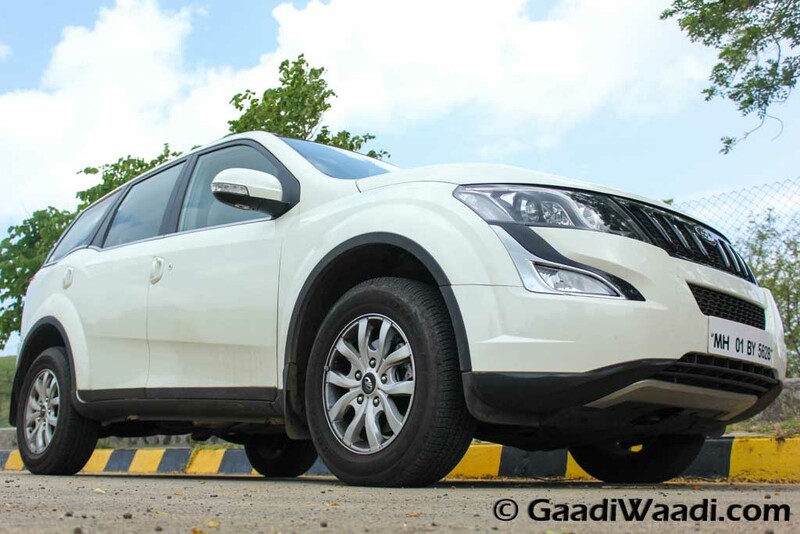 The SUV is a good touring machine as one tank of fuel gets you a whopping 800 km range. Thanks to a large tank and great fuel efficiency for a vehicle of this size. 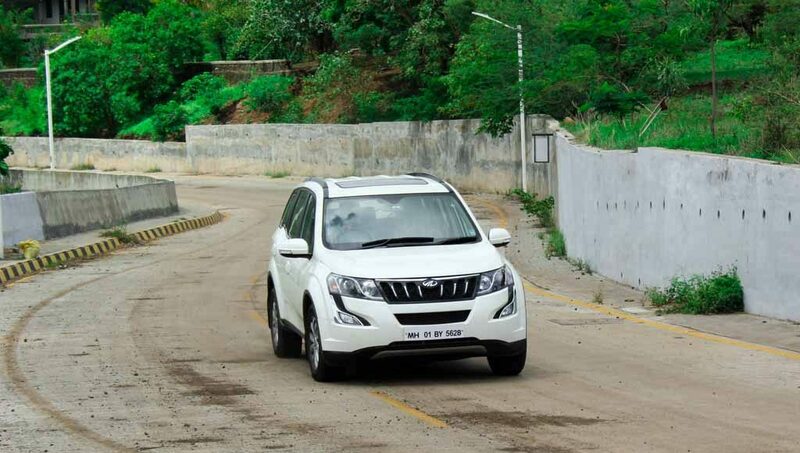 The XUV 500 is the only SUV, which is built on the monocoque chassis meanwhile its competition a level and above have dated ladder on frame chassis. The result is that it weighs almost 300 kilograms lighter than any SUV out there. 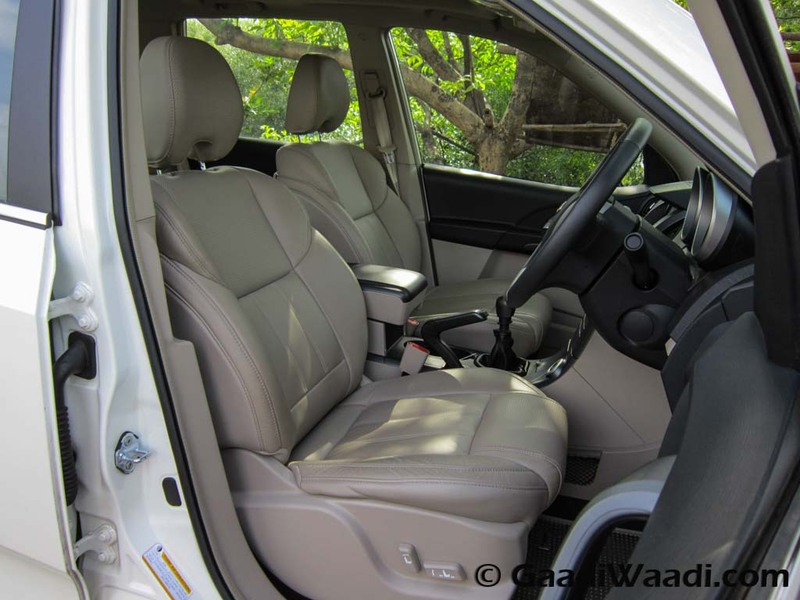 Monocoque means that the SUV is almost car like to drive in terms of hassle free style. Car is great chucking into gaps of traffic and does not feel large or humongous like its rivals. 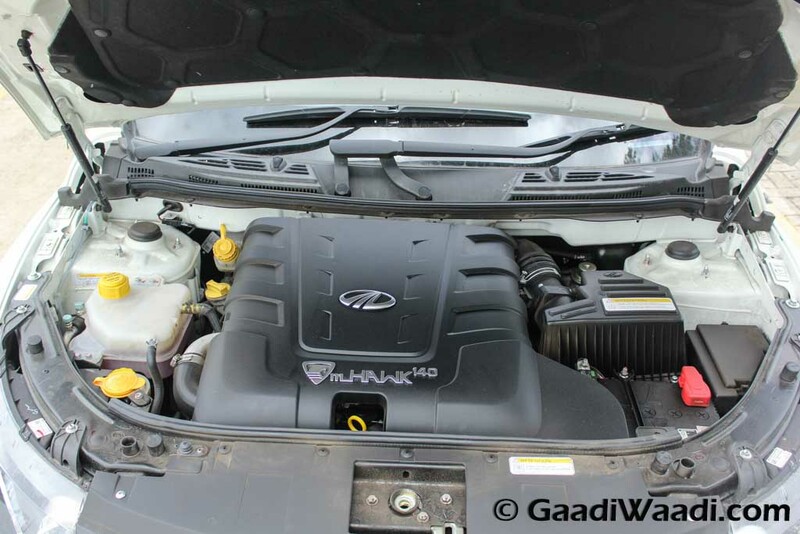 Fifty percent of the credit goes to the engine which also helps the car feel and perform better and lighter. Dynamics overall are good and there is very little body roll in the corners now. Changing lanes at triple digit speed is just like any sedan out there. Grip levels are good, but the tyre compound is on the harder side and do help in off-roading, but when you corner harder tyres squeal immediately and also while exiting the corner thanks to the massive torque steer, tyre are squealing all the time. Enthusiastic driving will see tyres changed at first itself or being changed earlier than expected. Ride quality is really good and it filters small to big bumps quite well without transferring them into cabin. Suspension works quietly but its the extra large bumps which send a sharp thud through the cabin. Steering as we said is not even direct. Don’t expect any feedback at any given speed either. Steering is good to hold though, and contours for your hands is spot on. Except the lifeless steering and torque steer everything seems good and that is the chassis and suspension tune up along with a fantastic engine and the equally awesome braking system. Mahindra is getting everything spot on. 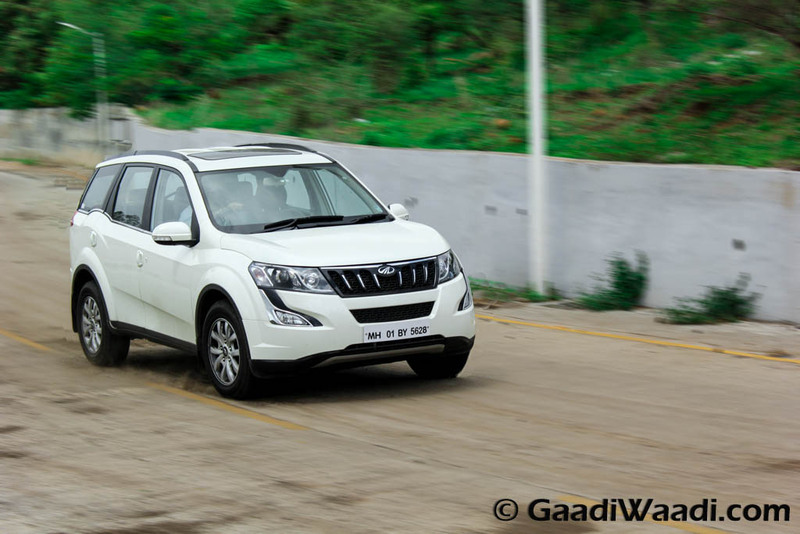 The well priced variants make it affordable for any kind of buyer. AWD is offered on two variants to choose from and equipment list on the W10 just made it hundred times more appealing to premium buyers. Premium car buyers also like automatic transmission, something missing on the XUV 500. 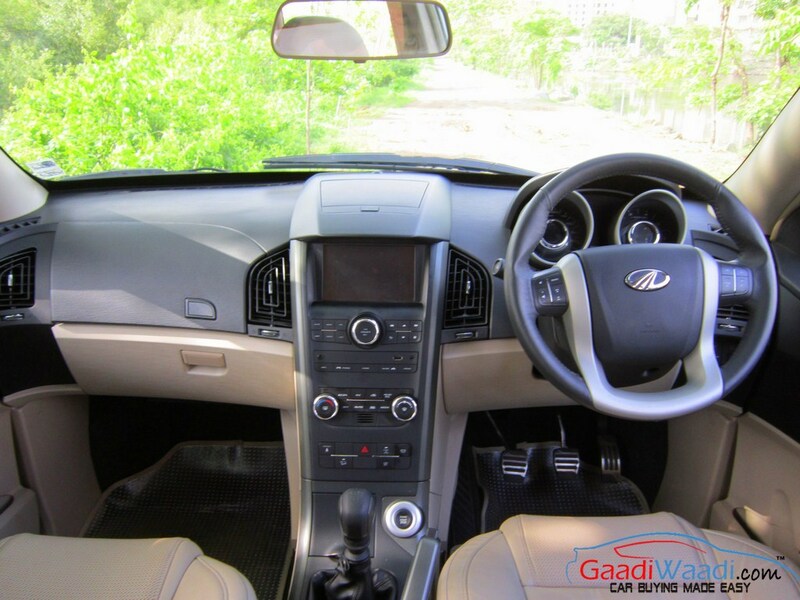 Mahindra sales and service isn’t that bad to live with but it is on the inconsistent side. 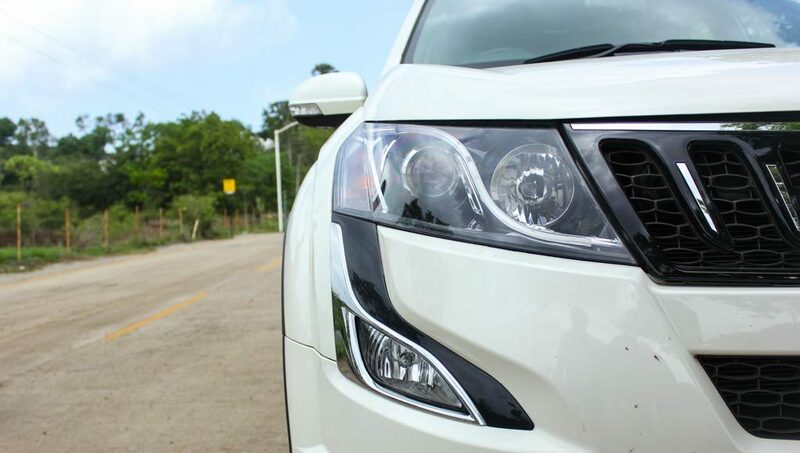 Mechanically is where the XUV scores very high as the engine, chassis and transmission make it almost car like to drive as it easily does what has told to be finished. 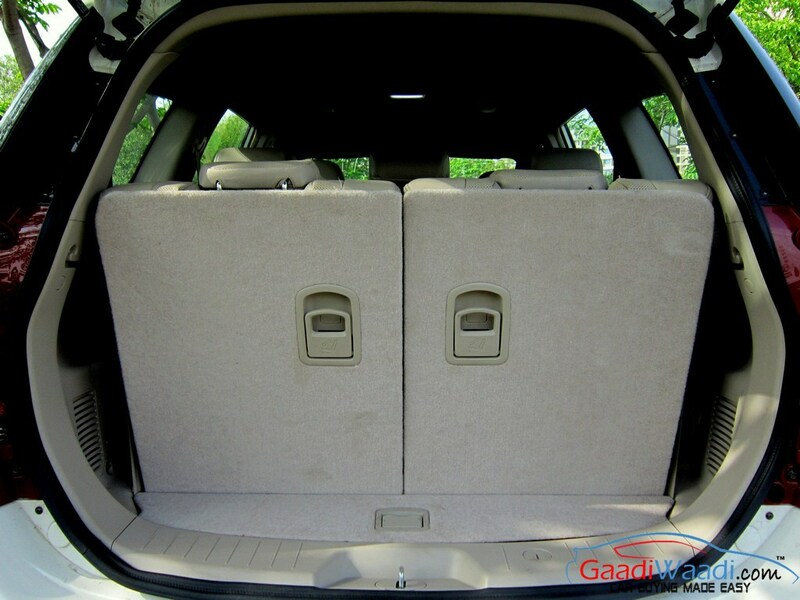 Whether it is city duties or cruising for hours and hours to reach your holiday destination. Space is good and so is the fuel efficiency. 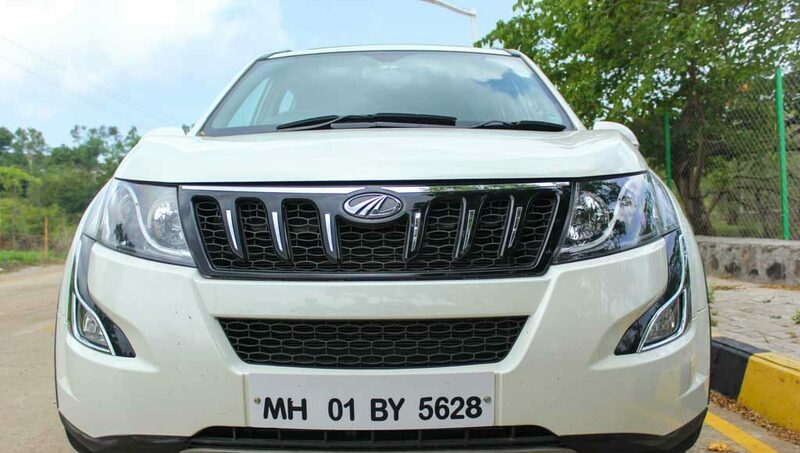 Mahindra XUV is already a success story for the company and despite dwindling sales (bare minimum) it is still segment leader when you consider the fact that it makes competition a segment and below can’t match its sales numbers and are not this practical at the same time. 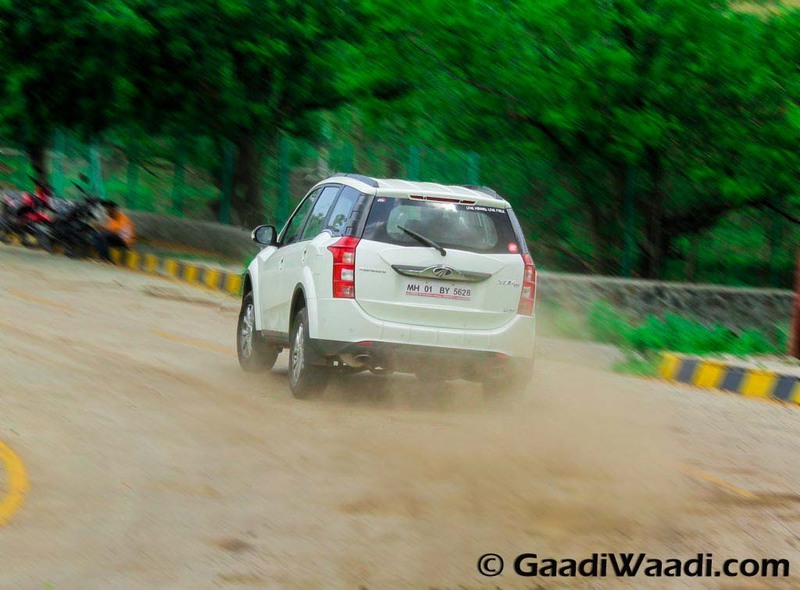 XUV is the only SUV which fun to drive, economical, practical and can do off-roading in the AWD variant. Variants are priced sensbily and top of the line variant is so loaded that going a segment above. 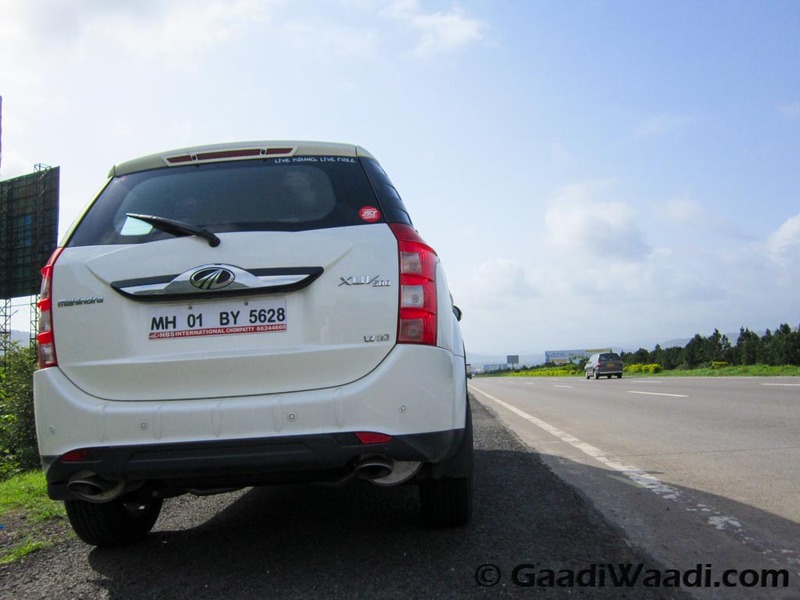 Mahindra cars should be cheap to run cheap to buy as well because its value for money, you are getting your money's worth every time. 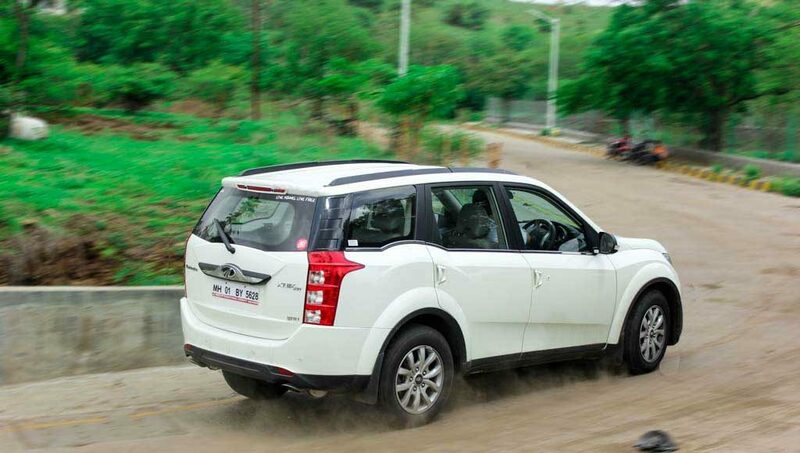 XUV will remain segment leader in sales and a superior product at the same time.